Coastal Academy is a non profit educational ministry which exists to support evangelical families in their choice to educate their children at home. The Bible is the inspired Word of God and constitutes completed and final revelation. God has existed from all eternity in three persons. All men are in violation of God's righteous requirements and His holy character both by nature and act; and are therefore under his wrath and just condemnation. Salvation is offered as a gift; free to the sinner. The Task: The primary responsibility for the educational development of children rests not upon the state or the church, but upon the parents. The Process: Christian education must be carefully conceived and diligently implemented. The Student: Created in the image of God, each student is a unified personality consisting of spiritual, social, and physical aspects. The Curriculum: The organizing medium by which the student, through the educational process, becomes properly oriented to God, to others and to the world for effective living. Parents select and provide their own curriculum according to their assessment of their student. 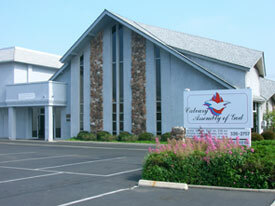 Calvary Assembly of God Church graciously rents us space.